ThatGalJenna: Fabric.com - if you need/want/love fabric this post is for you! Fabric.com - if you need/want/love fabric this post is for you! I wanted to post a quick little blurb for all my fellow fabric lovers out there. Fabric.com is having a huge clearance right now (I made good use of the sale trust me!) 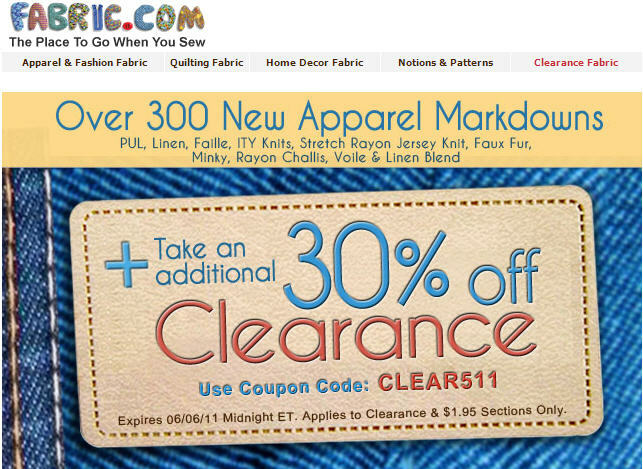 but to add onto that use coupon code - CLEAR511 for an additional 30% off all clearance items! If you haven't shopped on Fabric.com before it's really great, and they ship out your order within 48 hours of receipt of the order, and who doesn't like fabric delivered to their doorstep in a speedy timeframe? Anywho, that was it, I had to share since the offer expires soon! Thanks for the info and code. I have never shopped at fabric.com before but will head over and check it out.